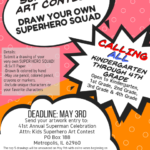 Calling all kindergarten through 4th grade artists!! We want YOU to create your own Superhero Squad for this year’s upcoming celebration! The top 5 drawings will be announced online on May 9th with online votes beginning May 10th through May 20th. PLEASE LIST YOUR NAME & GRADE ON THE BACK OF THE SUBMISSION, along with a contact email or phone number.